Choose Almond to create delicious meals for your family and friends! Our 10-inch nonstick copper frying pan is the perfect complement to your kitchen, built with durable copper to make every sandwich, sauce, stirfry, pan lasagna and more a joy to prepare. Our copper pans perform better than traditional skillets because of their excellent heat conduction, allowing you to prepare an array of recipes while controlling the temperature. Oven safe up to 420 F.
Rigorously tested to make sure it is durable and reliable, our ceramic coating makes cooking healthier for everyone. Almond's ceramic coating is PTFE and PFOA free, keeping nasty chemicals far away from your food. 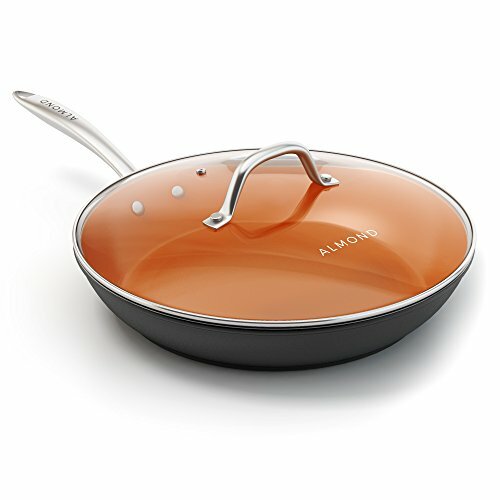 And thanks to its superb nonstick ability, it requires less oil while cooking. Get the same great-tasting food without the added fat and calories! Aluminum is lightweight, conducts heat well and can withstand repeated use with ease. That's why we chose it as the base of our copper cookware. The stainless steel handle is ergonomically shaped so it's comfortable in your hand, and riveted to the pan to reduce heat transfer while providing great durability and strength. Able to withstand up to 500 F, our tempered glass lid lets you see your food properly while cooking without losing heat from opening and closing. The glass won't shatter or warp, and can even be used with pots and pans of a similar size. Fit for gas, induction and electric ranges, even grill and open flame! Sear steak and pork chops for the grill, craft delicate bechamels and vodka sauces, or fry up a quick grilled cheese sandwich. No matter which heat source, your food will cook evenly and thoroughly in your new scratch-resistant copper frying pan by Almond. If you have any questions about this product by Almond, contact us by completing and submitting the form below. If you are looking for a specif part number, please include it with your message.